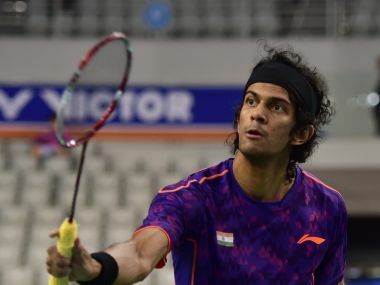 Almere: Defending champion Ajay jayaram reached the quarter-finals of the Dutch Open Grand Prix badminton tournament after notching up an easy straight-game win over Norway's Marius Myhre in the men's singles competition in Netherlands. Top seed Jayaram defeated 16th seed Marius 21-6 21-6 in a lop-sided contest. He will next face Brazil's Ygor Coelho De Oliveira. It turned out to be a disappointing day for other Indians as 11th seed Parupalli Kashyap lost 18-21 18-21 to sixth seed Raul Must of Estonia. Mixed doubles pair of B Sumeeth Reddy and Meghana Jakkampudi, however, reached the next round after defeating Netherlands' Jelle Maas and Imke Van Der Aar 21-16 21-18. In men's doubles competition, top seeds Manu Attri and B Sumeeth Reddy lost to Jacco Arends and Ruben Jille of Netherlands 19-21 19-21. Another Indian pair of Pranaav Jerry Chopra and Akshay Dewalkar, seeded third, also lost to Germany's Bjarne Geiss and Fabian Holzer 17-21 21-15 20-22. In women's doubles, fourth seed Maiken Fruergaard and Sara Thygesen of Denmark defeated India duo of Meghana and Poorvisha S Ram 21-10 21-9 in another match. Earlier in the day, Jayaram and Kashyap continued their good run to reach the pre-quarters of the men's singles competition. 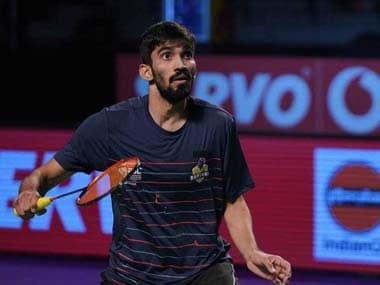 Top seed Jayaram, who has clinched the Dutch Open thrice in his career, spanked Philip Shisov of Bulgaria 21-7 21-9 in his second round match, while 11th seed Kashyap beat Denmark's Rasmus Gemke 21-11 7-21 21-10 in a 50-minute contest late last eigth. It was curtains for Lakhanee Sarang as he suffered a 17-21 17-21 loss against Raul in the second round. Earlier, mixed doubles pair of Sumeeth Reddy and Meghana beat German duo of Daniel Benz and Theresa Wurm 21-11 21-17 to set up a clash against Dutch combination of Jelle Maas and Imke Van der Aar. Fourth seeds Pranaav Cherry Chopra and Sikki Reddy, who clinched two titles this year at Brazil and Russia, defeated local pair of Ties Van Der Lecq and Alyssa Tirtosentono 21-5 21-16 and they will face France's Jordan Corvee and Anne Tran next.